measured at the doctor's office. The physical infant developmental stages form a five piece puzzle. Thankfully, we can complete this puzzle without a PhD in Biology. These infant development stages are perhaps the easiest of all the infant milestones to track. There is often confusion between the stages of motor skills development and the physical infant developmental stages. Motor skills involve learning to use muscles effectively. This means rolling over, reaching for toys, and learning to walk. Baby's mind is learning to give instructions and her muscles are learn to obey. In contrast, these infant developmental stages are dealing with the physical changes a baby will go through in the first year. 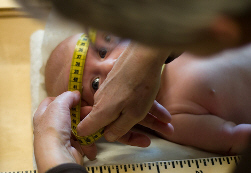 Head circumference is the most important tool doctors use to measure infant growth. This is because doctors use those measurements to ensure the brain is growing at a healthy rate (which is obviously very important!). It is easily tracked on a Growth Chart. I can easily weight and measure length, but getting a "measurement crown" on my squirmy 6-month-old is out of my league. I gladly leave that to the professionals. Instead, I take the measurements they take and add it on my own personal Growth Chart, placing it inside a health file for Elena. 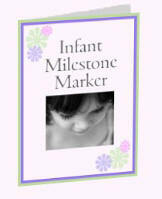 I have compiled all the milestones together in a free checklist for my friends and visitors in the Infant Milestone Marker. You can request this free checklist here. It goes through all the milestones (not just the physical infant developmental stages). To weigh your baby at home, first weigh yourself (or your husband) and then again, holding your infant. He will gain an average of 4.5 to 6 pounds (or 2 - 2.7 kg) before the end of the third month. He will grow about 3 - 4.5 inches (or 7.6 - 11.4 cm) longer. At birth, he will only be able to see about 8-15 inches away - just enough to see your face. What he does see will be mostly black and white. He will be able to sense light, shapes and movements, but most things will be blurry. Your face will be the most exciting thing for him, so make sure it's available often! Slowly, he will begin to gain control over his eyes and cease occasionally cross-eyed looks. By the third month, he will be able to focus them enough to track items. She should have doubled her birth weight by the end of the sixth month. Babies usually don't grow as much during this quarter. It tends to pick up again around the 6th to 7th month. She is beginning to understand depth perception, which helps her motor skills develop. By this time, she's an expert at identifying primary colors and is beginning to be sensitive enough to notice pastels. Some babies may start teething as early as four months. Watch for excessive drooling, fussiness, and endless chewing. His soft spots (called fontanels) are beginning to grow together. It may take up to 18 months for them to completely fuse together. The presence of the fontanels enabled her skull to make the treacherous journey through the birth canal. Her eyes are almost adult-like in clarity and depth perception. She probably prefers looking at items close up, but her vision is getting strong enough to recognize people and objects across the room. Her eyes are near to their final color. She is most likely ready to start eating solid food (but definitely not steak and potatoes). His should have tripled his birth weight by now. He has probably grown about 10 inches (25.4 cm) since birth and is most likely between 28 or 32 inches long (71.1 - 81.3 cm). I am continually amazed at the physical changes that will occur in the first year of Elena's life. To look at her little face now and know that in a year she'll be wearing those "giant" 12 months clothes! Following these infant developmental stages in the Milestone Marker makes it seem like they last a bit longer than they actually do - getting as close to "slowing down the clock" as I possibly can.